Scope Canvas is a free tool made as a backbone and starting point of our UX and Service Design projects. Join the dozens of startups, corporations and non-profits that use it to align their teams and create better products and services. Scope Canvas is distributed under the license Creative Commons Attribution-ShareAlike 4.0 International. Scope Canvas is used and taught in dozens of companies, startups and universities. Don't we have enough Canvases already? 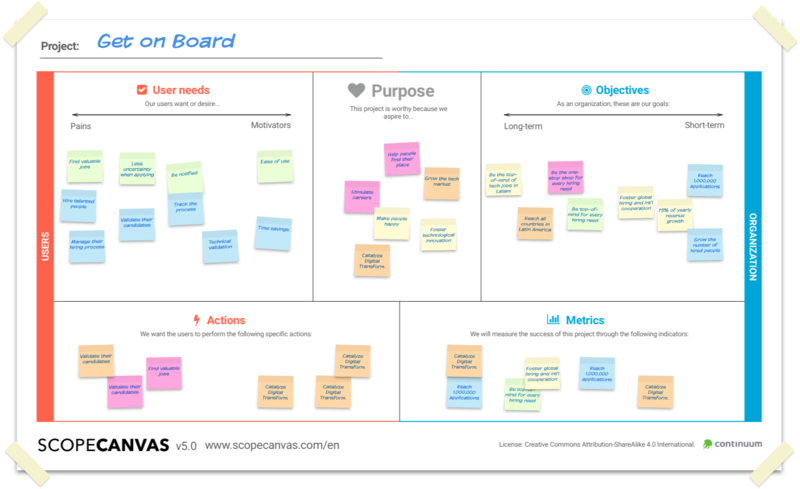 Scope Canvas draws inspiration from other similar frameworks, like the renowned Business Model Canvas, the Project Canvas or the Validation Board. But it satisfies a different purpose: connect user needs with business goals. It's amazingly easy to disconnect from the people using your product or service. Behind funnels, conversions, KPI's and customer lifecycles, there are human beings with pains, needs and motivations.. We need a tool that serves us as a constant reminder of that. This is how a Scope Canvas looks after a session. Download the Canvas in PDF, print it big (A0 works best) and attach it to a wall, ideally where you and your team are working. The recommended number of participants is between 3 and 15, but feel free to include every stakeholder whose vision may help the project. 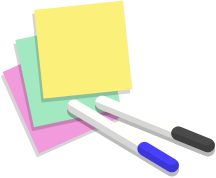 Give your team sticky notes and sharpies. Everyone is allowed to put notes on the Canvas. The session should feel like a brainstorming: don't censor or pre-filter ideas. Work through the following boxes with your team. Take your time with each: more than meeting a deadline or ticking all the boxes, it's the discussion and the exchange of points of view that adds the most value to the project. Feel free to start with the box that feels the most natural for the team. 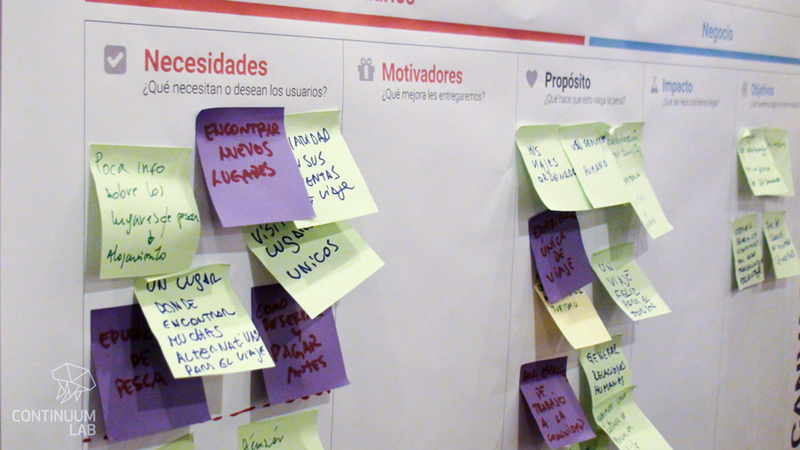 The purpose is at the heart of any project and defines the motivation of your team to venture in the proyect. What makes this worth it for you? What moves and motivates you? 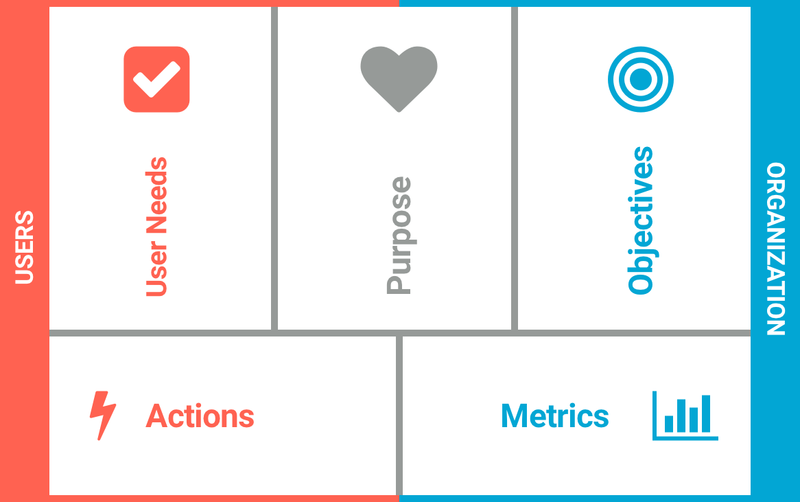 The purpose is always a balance between your goals as an organization and your user needs. It´s added value for everyone. More time for our customers. We want any home to be energy efficient. To position our brand as innovative. To be part of the start-up phenomenon. The needs of our users They are the next most basic and important step for a successful UX project. What problems or unmet opportunities have the potential to meet ? At this point it´s where the team will spend more time in the field, researching, talking to users, analyzing data and getting in touch with pains, needs and unmet opportunities. Save energy in a fun way. A mobile app to pay your bills. Save energy through a game. Now it´s time to get back to the inside of the organization. Ask yourselves what you want to accomplish with this project. What is the reason why you are investing money, time and energy in this? What is the priority for the business? Objectives can be specific improvements (reducing the time of completing a task, increase conversions) or overall consumer satisfaction. The important is that they must satisfy a concrete need of the organization, and at the same time be measurable. Reduce the average shopping time in at least 50%. 10.000 active and recurrent users in a year. More respect for the environment. What specific user actions mean conversion to us? How do we know that users are having their needs met? Both questions need to be answered at the same time: if you only focus on conversion and leave aside user needs, they will abandon your product over time. The actions are objectively observable, as if you were looking at them through a video camera. They translate into a concrete and direct action executed on the product or service. Use a energy savings simulator. Be more responsible with energy consumption. What will we measure to know if we are doing fine? Metrics allows us to quantify the return on investment of the UX project for the business. Metrics can be quantitative or qualitative. Not everything is Analytics and hard data; satisfaction surveys or usability measurement tools such as the SUS can also help. If no existing metric suits your needs, create one. Focus on measuring the specific success of the UX project, user satisfaction and customer loyalty. Frustrating as it may be, keep your attention on what the project actually is capable of changing. Stay away from Vanity Metrics: those that look good but reflect nothing. Keep posted on events and news related to the Scope Canvas. Got feedback, want to tell us about your experience using Scope Canvas or want to know how to get the best of it? Let's talk.